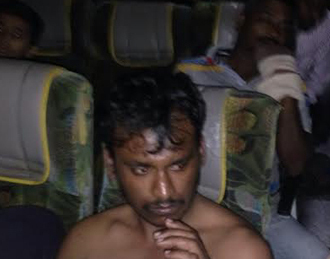 Dharmasthala, Mar 29, 2015 : A man said to be named Lokesh from Mysuru was thrashed black and blue for molesting 8-year-old girl in a private bus on March 28, the bus was travelling to Dharmasthala with many other passengers. It is said that he allegedly molested the 8-year-old girl who was travelling with her family from Bengaluru. The incident was observed by fellow passengers and the agitated passengers thrashed the accused and handed him over to Dharmasthala police station where the case in under investigation.